The Batangas welcome arch at the border of Santo Tomas with Laguna. Image source: Google Earth Street View. The Province of Batangas is among the oldest in the entire Philippines. It was first explored in 1570 by the conquistadores Master of Camp Martin de Goite and Captain Juan de Salcedo as instructed by Miguel López de Legazpi, in fact even before they saw Manila. 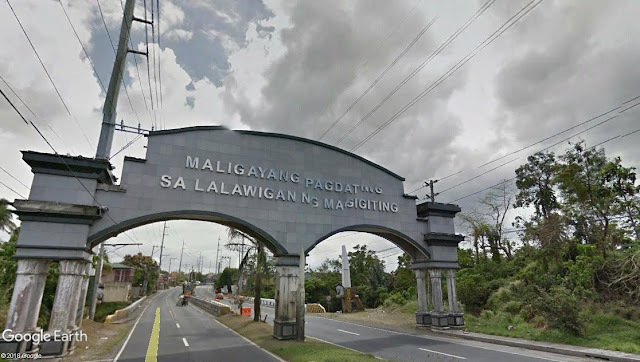 De Goite, in fact, in that trip made friends and vassals of the inhabitants of Balayan and villages such as Tuley along the coastline that in the present day spans the towns of Calatagan, Lian and Nasugbu. De Goite would also be named the first “encomendero” or feudal administrator of the area that was, at the time, called Bombon in the vicinity of Taal Lake, or what would ultimately become Batangas. Pueblos such as Taal, Bauan, Lipa and Tanauan would be founded by Augustinian friars along the shores of Lake Bombon as early as the sixteenth century. This means that modern-day cities and towns of Batangas that bear these same names are among the oldest in the entire country. In the present day, the province of Batangas has three cities (soon to be four once the bill converting Santo Tomas into a city is ratified) and thirty-one municipalities, with a total land area of 3,119.75 square kilometers. Its population as of the 2015 Philippine Census has grown to almost 2.7 million, with the city of Lipa having the most number of inhabitants. Provided in the table below are Batangas’ cities and municipalities along with land area and 2015 population for each. 2 Land areas from "Batangas," Wikipedia.